Read the transcript of the hour-long documentary. Follow students, teachers, and administrators from Western Guilford High School as they navigate the requirements of No Child Left Behind. Take a sample Algebra 1 or 10th grade writing test. Thoughts from Michael J. Petrilli, former Education Department official, on the successes and failures of No Child Left Behind. American RadioWorks' reporting on education is funded by the Spencer Foundation, supporting research to improve learning. Put to the Test was produced in cooperation with North Carolina Public Radio – WUNC. In January of 2002, just months after September 11, President George W. Bush visited a high school in Hamilton, Ohio. Students and teachers lined the stage, an enormous American flag behind them. On stage to greet the president - Senator Ted Kennedy, one of the country's most powerful Democrats. It was a day of bi-partisan celebration. Congress had just passed the No Child Left Behind Act, hailed by leaders on the left and the right as the most significant education law in a generation. The president was in Ohio to sign the law and explain why a change was needed in American schools. "I read a quote from a young lady in New York. She said, 'I don't ever remember taking an exam. They just kept passing me along. I ended up dropping out in the 7th grade. I basically felt nobody cared.'" There was no national requirement to test and measure all students, to make sure everyone knew how to read and write, do basic math. The president told the crowd in Ohio that the United States needs testing; he called it the "right" thing for America. "I understand taking tests aren't fun," the president quipped. "Too bad. We need to know in America. We need to know whether or not children have got the basic education." And testing was just the beginning. The more ambitious endeavor: equalize education. To do that, the law set up a new definition of what it means to be a good school. This new definition, adequate yearly progress, or AYP, requires schools to show they're raising test scores among each group of students. Schools can't hide in good averages anymore. They must prove their poor and minority students are passing the tests too. This new definition of what it means to be a good school is having a dramatic impact on everything about education. 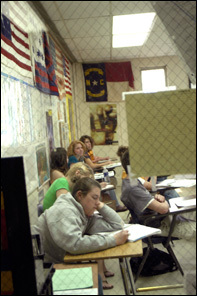 Four years after President Bush signed No Child Left Behind, there's a different kind of celebration going on in the media center of Western Guilford High School in Greensboro, North Carolina. The walls are decorated; there are cakes and casseroles on the tables. Veteran English teacher Angela Johnson is calling it quits, abruptly, in the middle of the school year. Students, colleagues and friends from her 30-year career have gathered to say goodbye. Someone hands her a microphone, and she pulls her glasses up onto her nose, the prepared English teacher, ready with a speech. "I believe that students are drowning in information and starving for knowledge," she tells the crowd. "I believe that what is planted into a student, not what is poured into him, matters more. And I believe that we have lost our way today because we have forgotten or failed to remember those truths." Angela Johnson doesn't really want to retire. She's still in her early 50s. But she says teaching has changed. It's no longer the job she once loved. "Why you want to teach is because you love a subject, you love the children, you want them to love it too," she says. "And when it's boiled down to 100 multiple choice questions, that's not it!" Johnson shakes her head and sighs. She says schools are becoming so focused on test results that education is being reduced to what can fit on a multiple choice exam. "And to me it's taken the absolute joy out of learning and teaching because the students begin to see learning as just an end; that you must do this to get to that point. And there's nothing educational in the grasping of it, the trying to understand it, the appreciation of it," she says. "And I don't think we're producing more educated children. I think we are producing more astute test-takers. In fact, now we have classes where we teach children how to take a test. I don't know, it doesn't sound right does it? We should be teaching children material - literature, math, science. Not how to take a particular test, do you think?" Ask any teacher what they think of all the standardized testing that's come with No Child Left Behind, and they're likely to sound a lot like Johnson. Ask the principal at Western Guilford High School what he thinks, and he'll tell you the testing is absolutely necessary.